GENEVA, Switzerland, February 29, 2012 (ENS) – John Scanlon, secretary-general of the Convention on International Trade in Endangered Species, CITES, Tuesday expressed “grave concern” over the recent poaching of close to 450 elephants in Bouba Ndjida National Park in northern Cameroon. 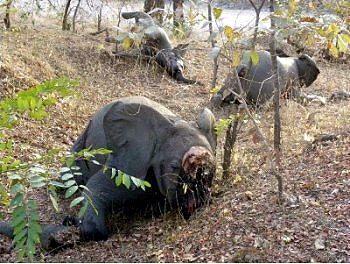 He said the CITES program for monitoring the illegal killing of elephants shows increased levels of poaching in 2011. “This spike in elephant poaching is of grave concern not only to Cameroon, a member state of CITES, but to all 38 range states of the African elephant, as well as the Secretariat,” said Scanlon. “This most recent incident of poaching elephants is on a massive scale but it reflects a new trend we are detecting across many range states, where well-armed poachers with sophisticated weapons decimate elephant populations, often with impunity,” warned Scanlon. Fourteen dead elephants were found in Bouba Ndjida National Park, Cameroon last week, slaughtered by poachers for their tusks, which were cut out of the carcasses. Shots were heard on February 20 in the Bouba Ndjida National Park in northern Cameroon, near the border with Chad. The 14 elephant carcasses were discovered two days later. The latest dead elephants were found just a week after the discovery of at least 200 dead elephants in Cameroon, and more will be found in the coming weeks as gunshots continue to be heard, said Jason Bell, director of International Fund for Animal Welfare’s Elephant Programme. Bell believes that Sudanese poachers who travel south through Chad on their way to Cameroon are likely responsible for the continuing slaughter of elephants. In the past few years, Chad’s elephant population has plunged from several thousand to a few hundred, forcing the poachers further afield. 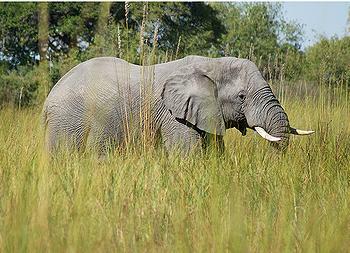 Elephants currently inhabit parts of 38 countries in sub-Saharan Africa. Although up to 70 percent of the African elephant’s range is believed to lie in unprotected land, most large populations occur within protected areas such as Cameroon’s Bouba Ndjida National Park. Since 2004, the species, Loxodonta africana, has been classed as Vulnerable to extinction by the IUCN Red List of Threatened Species. Their conservation status has improved since African elephants were listed as Endangered based on an assessment conducted in 1996 by the IUCN SSC African Elephant Specialist Group. Conservation groups credit the upgraded listing to a CITES ban on international trade in African elephants and their parts that took effect in 1989. IFAW and many other conservation groups blame the recent upsurge in elephant poaching on a legal “one-off” sale of ivory from African stockpiles to China and Japan allowed in 2008 by the Convention on International Trade in Endangered Species, CITES. A total of 108 tonnes of ivory from Botswana, South Africa, Namibia and Zimbabwe were sold. Conservationists maintain that legal ivory sale increased demand and provided cover for illegal ivory trafficking. 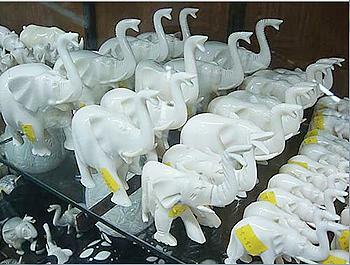 The result was a spike in ivory seizures in 2009. Ivory seizures have increased since then with a total of 23 tonnes of ivory seized in 2011 – the highest amount since recordkeeping began. The seizures represent a small fraction of the total amount of ivory being trafficked around the world, IFAW points out. “Our first goal is to protect wild elephants so we have anti-poaching support for rangers and law enforcement – especially in West and Central African countries where elephants are most vulnerable,” said Bell. 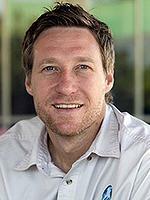 Scanlon has designated Ben Janse Van Rensburg, CITES Chief Enforcement Support, as the point person for coordinating support for response to elephant poaching incidents. Van Rensburg is engaging with the countries concerned as well as with partners in the International Consortium on Combating Wildlife Crime – Interpol, the World Customs Organization, the United Nations Office on Drugs and Crime and the World Bank – to share intelligence that could be used to help bring the perpetrators to justice, to locate and confiscate the poached ivory, and to help prevent future incidents. Tools such as wildlife forensics, DNA profiling and community-based anti-poaching are being explored as complementary tools to support the enforcement efforts from the governments. The 2009-2012 spike in poaching that has been detected is affecting African elephants across much of their range. 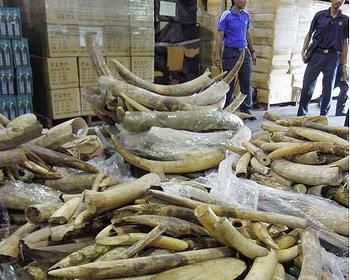 Illegal ivory seized overseas has been shipped from East, West, Central and southern Africa. Scanlon says CITES authorities have not been able to identify the actual origin of the seized ivory, except for a few cases where it was possible to make DNA profiling analysis. Therefore, a national, regional and international approach to manage and conserve elephants is essential. This most recent mass killing demonstrates the need for effectively implementing the Action Plan for the control of trade in elephant ivory that was created under the auspices of CITES, he said. The African Elephant Fund launched last August at the 61st meeting of the CITES Standing Committee has collected US$250,000 in contributions from France, Germany, the Netherlands and the United Kingdom, and South Africa is expected to contribute shortly. Anti-poaching enforcement efforts are expected to take a leap forward March 27-29, when the Interpol General Secretariat and the UN Environment Programme will welcome the international chiefs of environmental compliance and enforcement at Interpol Headquarters in Lyon, France.